I’ve had some serious motivation issues these last few weeks due to this horrible sinus cold/infection I have. It is lingering and lingering and lingering and twice I thought that I was starting to get better only to feel horrible again the next day. Today was one of those days where I woke up worse off with a sore throat added to the mix. Anyways, my point is that I’ve not been working out. I’m not one of those people that can just power thru a workout with a cold, especially a big sinus cold and especially not in front of people at a crossfit box where I can blow snot in every single direction when I unexpectedly sneeze. 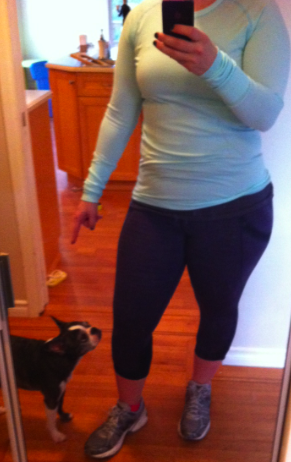 Hence, the major muffin top you are seeing in these pictures with my Run: Chase Me Crops. When I first got these crops which are known to run snug, they were in fact snug yet still comfortable and barely any muffin top. 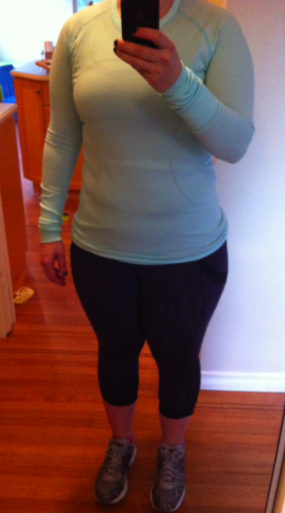 Today I’m spilling out over the top and I am not liking it at all. My lack of activity is partly to blame but also, when I have a cold like this all I want to eat are bland carby foods. crackers, toast, dry cereal. I have no sense of taste right now and only have the gratification of eating the quick fix of the white poison. All of you paleo folk are shuddering at the though and I only have myself to blame for this. To boot I also have a major skin breakout due to my Differin prescription (acne med which causes you to break out when you first start it). The stuff works really well for me but during the beginning phase my skin is dry, sore, peeley and painfully broken out. Boo!!! So all of this makes me feel like a big pile of ugly poo and all that is left is to drag myself out for what I know is going to be a craptastic run. Seriously, I may only make it a mile today but I need to do something. Wish me luck! Passion colored socks that don’t match. And one petulant little dog that doesn’t do ‘sit’. "Run: Chase Me Tank in Lavender Dusk/Multi March Wee Are From Space"
"Heathered Ultraviolet Cool Racerback Tank Spotted"